Cook asparagus in boiling water for 3 to 4 minutes or until crisp-tender; drain and set aside. Cook pasta according to package directions. Meanwhile, in a skillet, cook bacon until crisp; drain and remove to a paper towel. In the same skillet, saute onions until soft. Add asparagus and pepper; heat through. 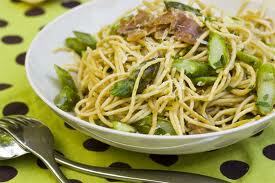 Drain pasta; toss with asparagus mixture, bacon, margarine, sour cream and cheese. Serve immediately. Yield 8 servings. *NOTE: The girls at Adrians LOVE this! Sarah is a long time staff member and has made this many times for us…she recently brought this delicious comfort food for us when I had surgery… Definately makes you feel better!